82 MMS September 2017 mmsonline.com FEATURE reduction on the aforementioned oil pan par t. That savings, from 30 hours to 14, resulted from a feed-rate boost from 75 to 500 ipm. 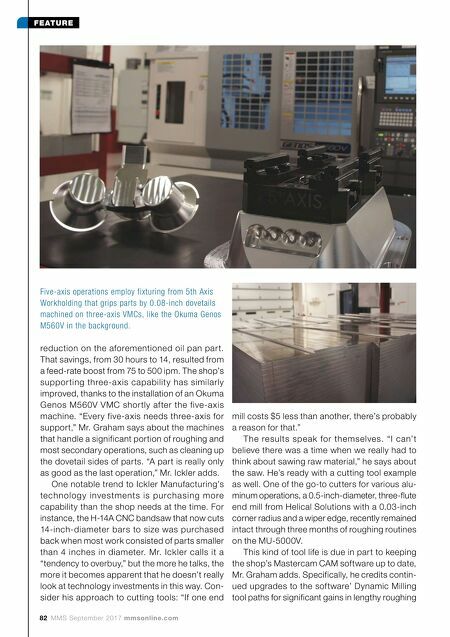 The shop's suppor ting three-a xis capability has similarly improved, thanks to the installation of an Okuma Genos M560V VMC shor tly af ter the five-a xis machine. 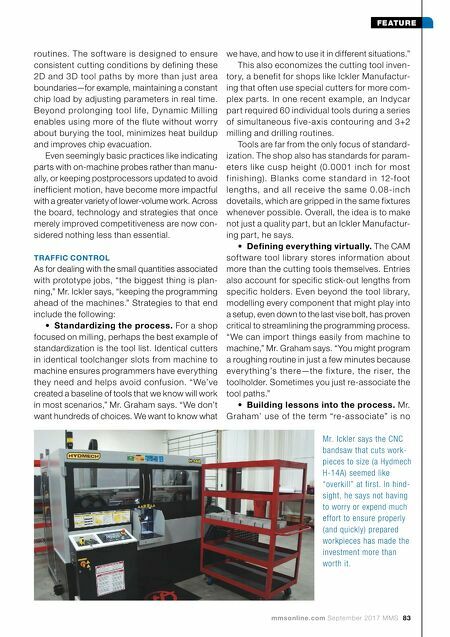 "Every five-axis needs three-axis for support," Mr. Graham says about the machines that handle a significant portion of roughing and most secondary operations, such as cleaning up the dovetail sides of parts. "A part is really only as good as the last operation," Mr. Ickler adds. One notable trend to Ickler Manufacturing's te chnology inve stme nts is purchasing more capability than the shop needs at the time. For instance, the H-14A CNC bandsaw that now cuts 14-inch-diameter bars to size was purchased back when most work consisted of parts smaller than 4 inches in diameter. Mr. Ickler calls it a "tendency to overbuy," but the more he talks, the more it becomes apparent that he doesn't really look at technology investments in this way. Con- sider his approach to cutting tools: "If one end mill costs $5 less than another, there's probably a reason for that." The results speak for themselves. "I can't believe there was a time when we really had to think about sawing raw material," he says about the saw. He's ready with a cutting tool example as well. One of the go-to cutters for various alu- minum operations, a 0.5-inch-diameter, three-flute end mill from Helical Solutions with a 0.03-inch corner radius and a wiper edge, recently remained intact through three months of roughing routines on the MU-5000V. This kind of tool life is due in part to keeping the shop's Mastercam CAM software up to date, Mr. Graham adds. Specifically, he credits contin- ued upgrades to the software' Dynamic Milling tool paths for significant gains in lengthy roughing Five-axis operations employ fixturing from 5th Axis Workholding that grips parts by 0.08-inch dovetails machined on three-axis VMCs, like the Okuma Genos M560V in the background.